With a refined interface and a new full screen mode that lets you work on your outline as well as your text without distraction, StoryBox 2 allows you to write your stories with more flexibility than ever before. And with it's updated exporting functionality, the easiest ePub exporter on the planet only got easier! The best and easiest way to write a novel and prepare it for Indie publishing via Amazon, Barnes & Noble and others! 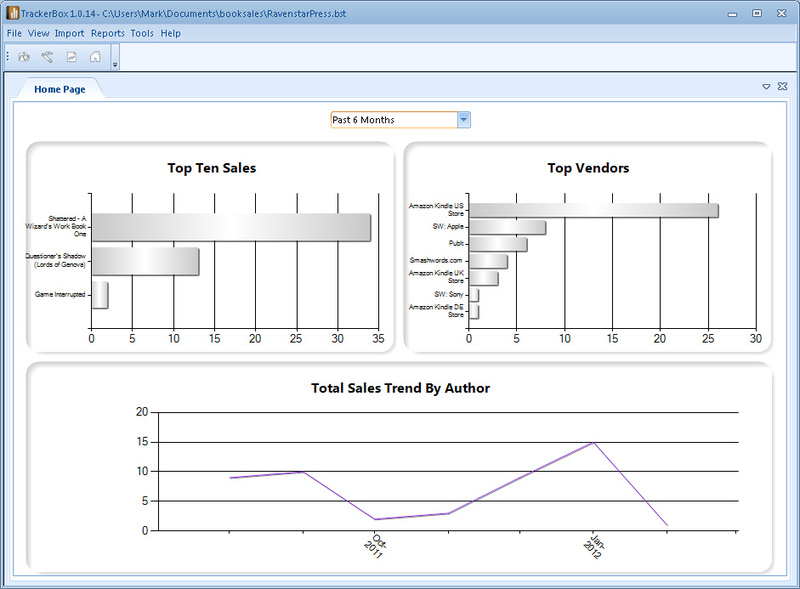 The ultimate software for your ebook sales tracking and charting needs. Works with all the major sites (and some minor ones, too). 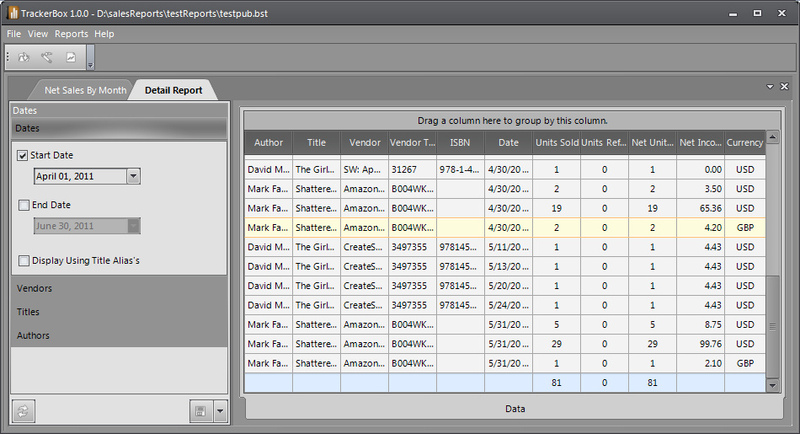 Do you spend hours of time each month copying your sales report data from your book sales into spreadsheets? Worse, do you spend a pile of money each month to pay someone to do it for you? Have you ever found a mistake in your copied data? I'd like to intruduce you to TrackerBox, the time saving, headache reducing software that will help you keep track of all of your book sales, no matter where they are sold. 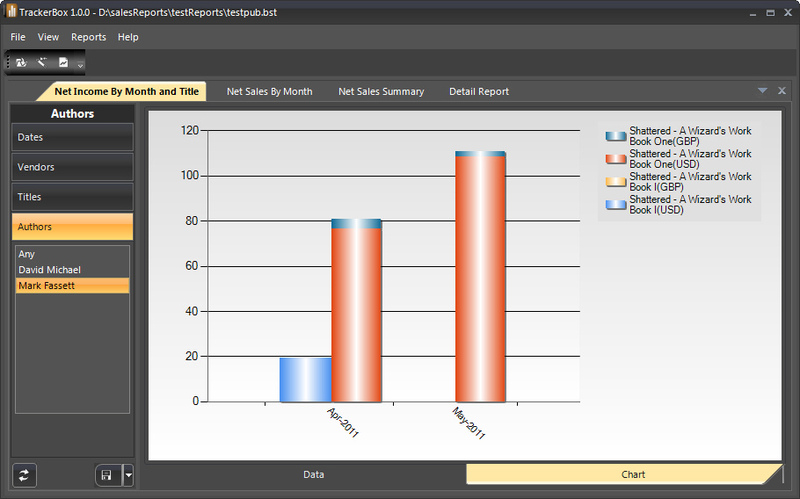 Instead of having to download the report, open it in your spreadsheet of choice, and copy the data by hand into a spreadsheet that you had to spend hours designing, you could just download the report and click Import on TrackerBox, and see your sales data in as little as a few seconds. Amazon, Barnes & Noble, Apple, Kobo, they're all supported. 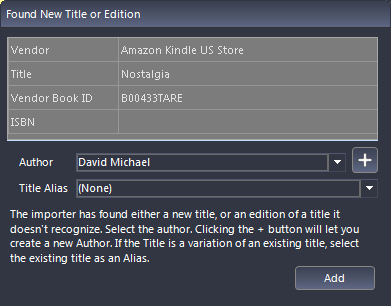 It saves even more time if you have multiple pen names, or authors. 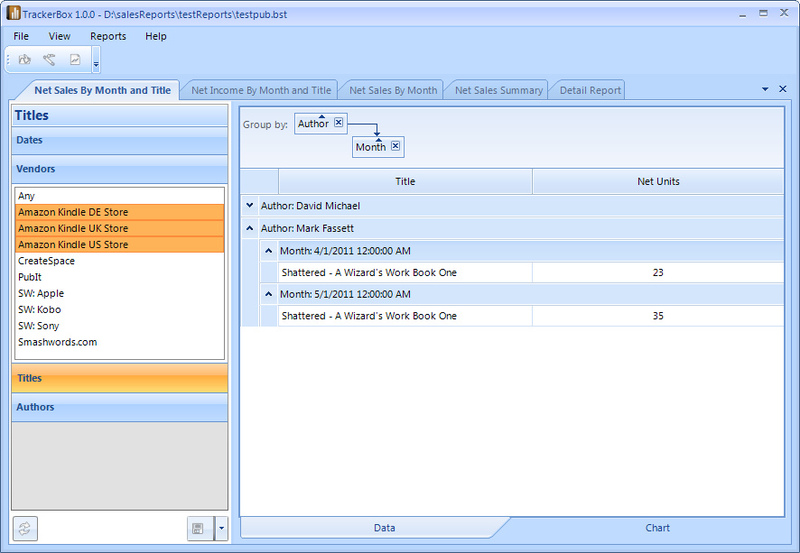 Do you need to produce a sales report for a co-author? 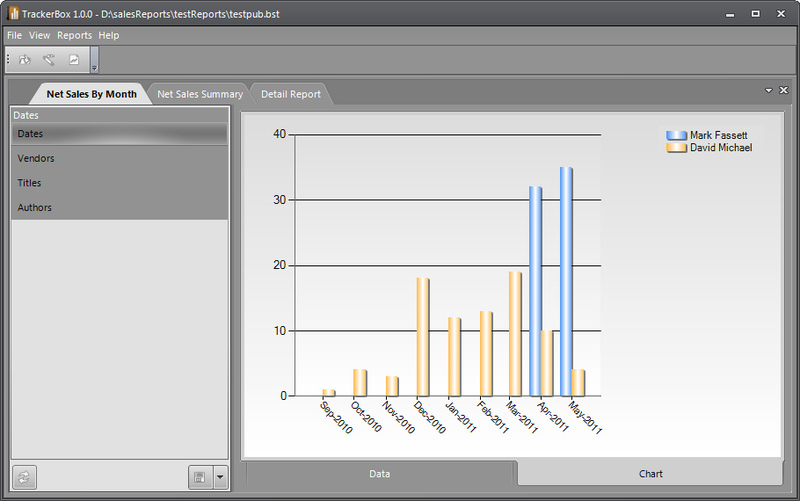 You can do that quickly with exports of the reports to xls, csv, pdf and html. Self publisher or small publisher, TrackerBox will save you time and money. Try the 45 day FREE TRIAL! Import publisher royalties and other sales, either through a easy to use dialog or a specially designed spreadsheet that is simple to fill out. You can download the latest version of TrackerBox here. It's free to try for 45 days and runs on Windows XP (SP3), Windows Vista, Windows 7, 8, and 8.1. You can use our support site to enter any bugs or issues or feature requests you find. You'll be able to track the progress of your issues there, too. There are menu items under "Help" in TrackerBox that will take you there, too. If you find that you love TrackerBox, but hate all the not quite subliminal "Buy TrackerBox!" hints all throughout the application, go here and get it for only $89.99! 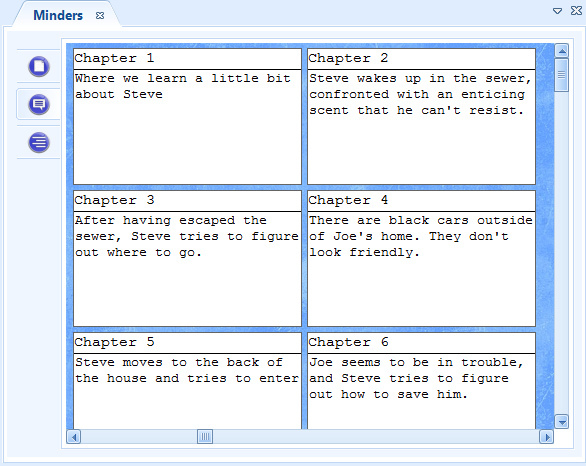 Back when I first started work on StoryBox, I had a need for a simple to use piece of writing software. It would do just what I needed without a lot of extra bells and whistles. I didn't want bells and whistles getting in the way of my writing. I also desired a flexible interface. If I wanted to move my synopsis to the left side of the screen instead of the right, or the top instead of the bottom, I thought I should be able to do that. 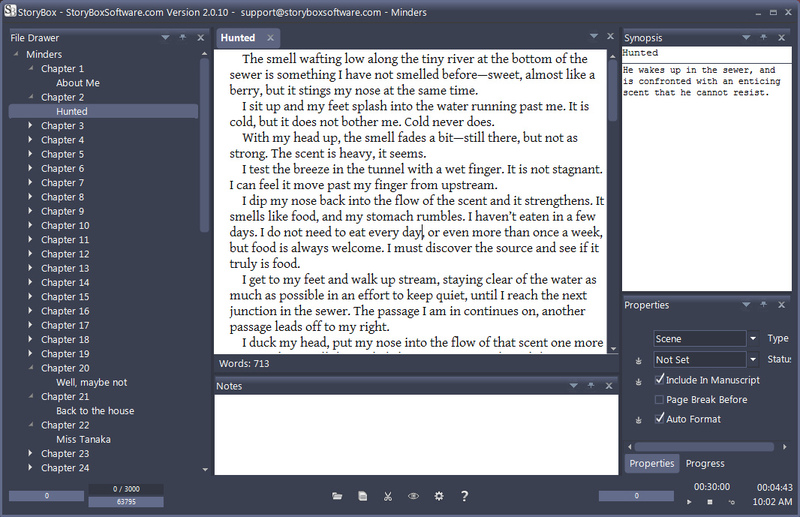 Now, after two years of using StoryBox nearly every day in my writing, I'm proud to introduce StoryBox 2. With a more flexible full screen mode and a new bottom MenuBar that keeps extraneous text out of your view, StoryBox 2 will help you improve your productivity while still allowing you to organize your book and your notes in any fashion you desire. 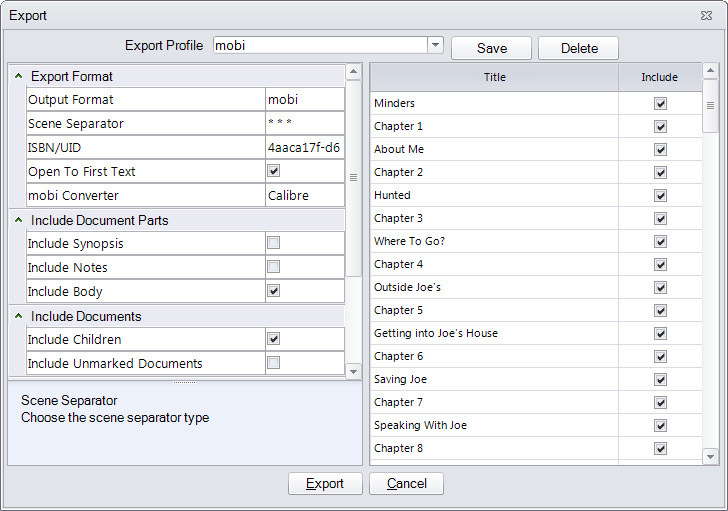 Among the improvements are a new Export dialog that lets you save time when creating eBooks for multiple vendors by giving you profiles that you can use to quickly recall your export settings, a full screen mode that allows you to view any of the tool windows that you choose or even view more than one document at a time, a Countdown Timer and a related progress bar for concentrated writing sessions, and a reorganized set of properties and menus that combine things more logically so that they are easier to find. There are new wizards for creating projects and importing existing documents, and the ePub export is now standards compliant. 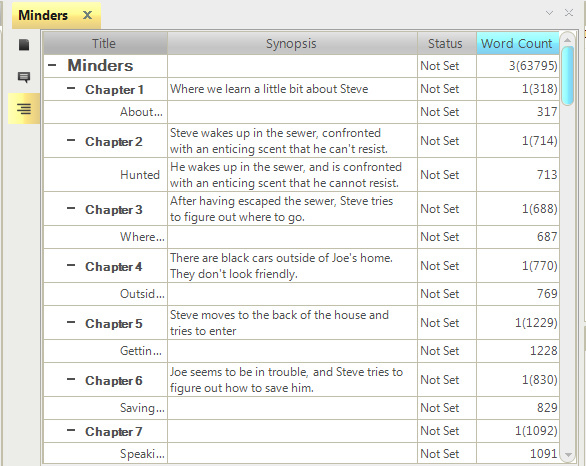 Two new themes and a host of other minor changes round out StoryBox 2. "But wait!," you say. "What will it do for me?" 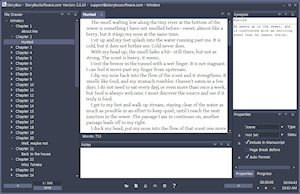 StoryBox 2 will make your writing life easier. 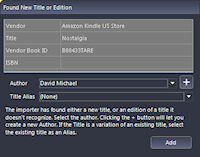 It will make publishing eBooks as easy as it can be. You do not have to do any complicated formatting or crazy gyrations to get great looking eBooks that work well with every major eBook retailer (including Amazon, Barnes & Noble, and Kobo). If you like to track your word progress, StoryBox 2 has six different wordcount measurements, including measurements for the day, the current writing session, and the current timed writing burst. 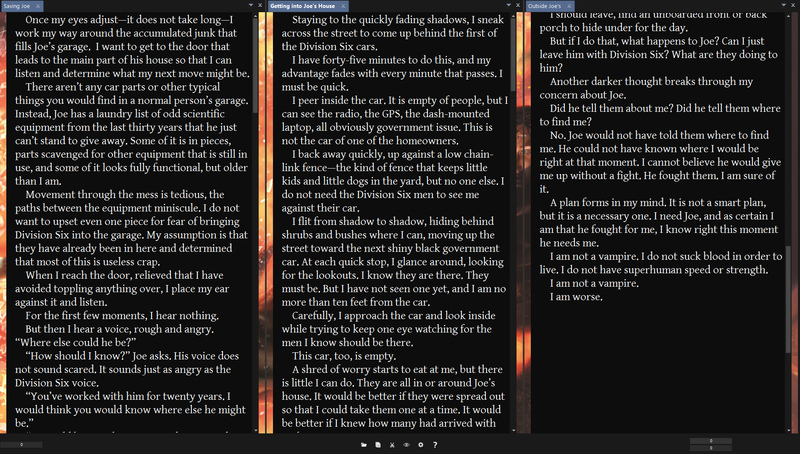 You can use the full screen mode to block out your desktop so that you can concentrate on your writing (if you use multiple monitors, it will even block out the other monitor). 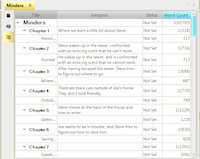 Do you need to see your synopsis in full screen? You can do that. Do you need to watch your progress or use the Countdown timer? You can do those, too. You can even use the Outline mode and the Storyboard mode in full screen. 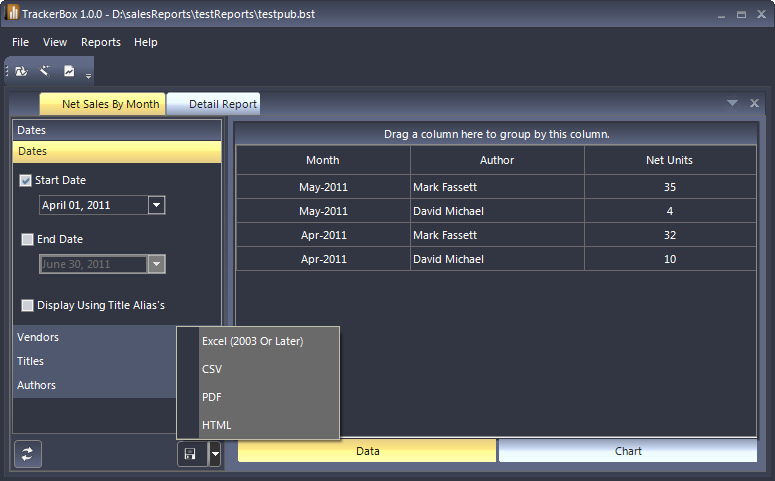 And now, with StoryBox 2, you can even have multiple documents open in full screen at the same time, side by side. 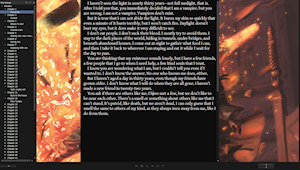 StoryBox 2 saves your typing automatically, so you don't have to. It now has an automatic backup feature that will back up your project to another folder, even another drive, when you close it. Used with a cloud based automatic storage application like DropBox, this can save your bacon in the event that your cat runs across your keyboard while you're out getting coffee (yes, this happened to me). 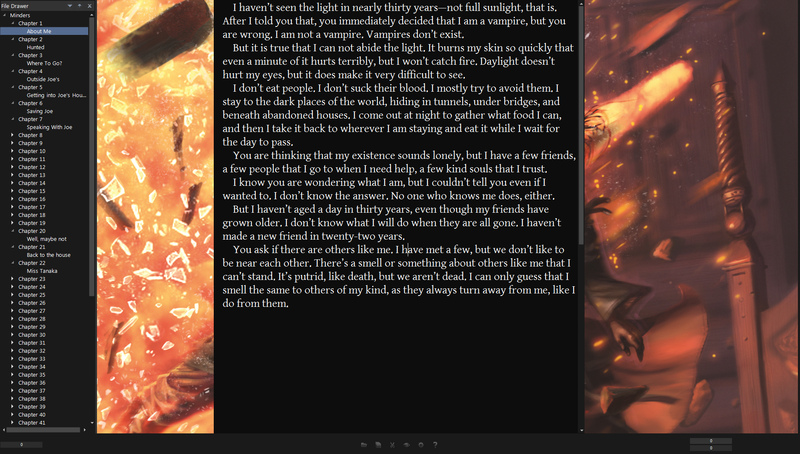 The best part about StoryBox is that I use it every day. I'm not just making this software to sell it. 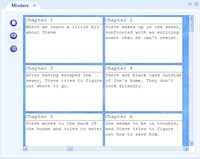 I'm making StoryBox 2 so that I can write in it. Is it as full featured as some of the other competitors? Possibly not. Is it easier to understand and use? I certainly think so. At the very least, give StoryBox 2 a try. The trial runs 45 non-consecutive days. It's not 45 uses. It's 45 actual days of at least one use per day. You can spread them out as long as you like. If you use it for NaNoWriMo, it'll get you through that month with a few days on either side to spare. I think you'll like StoryBox 2. If there was a better piece of software for the job, I'd be using it, instead. Try the 45 (non-consecutive) day FREE TRIAL! There is a really long list of all the changes between StoryBox 1.5 and StoryBox 2 on the Release Notes page. If you are a current owner of StoryBox 1, there is no upgrade fee for StoryBox 2. 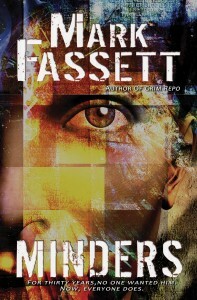 However, if you feel you must support me, try purchasing one of my books from my bookstore. StoryBox 1 and StoryBox 2 can be used side by side. However, any projects that you open in StoryBox 2 will no longer open in StoryBox 1. If you are a "free" user of StoryBox 1, you will get a 45 day trial just like everyone else. After that, you will be required to purchase StoryBox 2 if you wish to continue using it. Your installation of StoryBox 1 will continue to work as it has, but will not receive further updates, nor will it be available for download. You can use our support site to enter any bugs or issues or feature requests you find. You'll be able to track the progress of your issues there, too. There are menu items under "Help" in StoryBox that will take you there, too. If you find that you love StoryBox, but hate all the not quite subliminal "Buy StoryBox!" hints all throughout the application, go here and buy it now for only $34.95! Copyright © 2010-2016 Mark Fassett. All Rights Reserved.